From left are event chair Lois Larimer, County Executive Mike Gannon and Relay for Life team captains Melba Chaney, James Adkins, Sandy Hollandsworth and Cheryl Johnson. 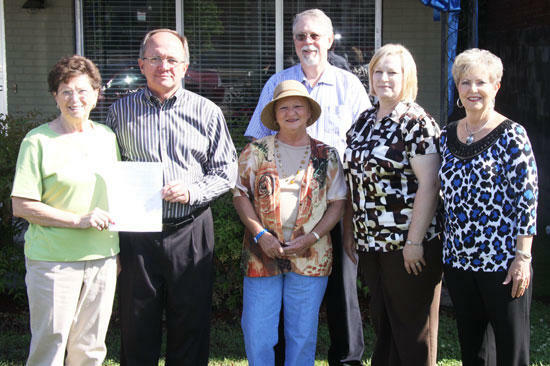 Cannon County Executive Mike Gannon presents Relay for Life Chairperson Lois Larimer with a "Relay for Life Proclamation" declaring May 21 "Relay for Life Day" in Cannon County. “Relay For Life Day” In Cannon County and encourage citizens to participate in the Relay For Life event at Dillon Park on May 21st starting at 6:00PM." Cannon County's Relay For Life of will kick off with a special Survivors Lap, a moving experience honoring those who have defeated cancer. Survivors will join together to take the Relay’s opening lap, unified in victory and hope, while the rest of the event’s participants surround the track to cheer them on. Relay For Life is a unique grassroots fund raising event in which individuals and teams of participants in nearly 5,100 communities nationwide walk around a track to celebrate the lives of those who have faced cancer, remember a loved one lost, and commit to fight back against the disease. The money raised through Relay For Life supports the American Cancer Society’s efforts to create a world with less cancer and more birthdays. Information about making a donation, forming a team, or walking in the Survivors Lap is available by calling 615-563-2538 or visiting RelayForLife.org/cannon.